Some men have a passion for a beard. For ages and across civilizations, beard has generally been reverred as sign of knowledge, caring and wisdom !! Steve Jobs who passed away recently was a visionary and genius; he left behind a huge legacy – Apple Inc. Rich tributes continue to pour in as the Corporate World remembers him. It is reported that Apple Inc. plans to close some of its retail stores for at least an hour today (19th Oct 2011) in a gesture that coincides with the company's planned celebration of co-founder Steve Jobs's life at its headquarters. A pod cast reportedly is to be aired and the newsreport suggests that Apple hasn't told retail employees why it plans to temporarily close the stores during normal working hours, though these people note that such closings rarely happen for events other than special product launches. Read an article in Forbes.com - a tribute praising Steve Jobs as a money-making personality. It reads that Steve Jobs certainly was one, but so also are the lesser-known creators of abundant value in the business sector who sustain the world economy like the Atlas who holds up the globe. These are the 1% of us, the rare giants of industry, commerce and finance who occupy Wall Street suites, Silicon Valley campuses, and all great cities in between. These are the best and the brightest, not the worst and the dimmest, those who don’t whine that others owe them jobs or handouts but practice the virtues of rationality, honesty, integrity, independence, productiveness, and pride. Jobs’ recent death elicited the requisite commendations and eulogies, the most worthy of which came from those who knew best his character, life, work, and achievements. All go a long way to prove the towering personality of Steve. But in life, not always that such icons are well-treated and well remembered – there are some who do not get the coverage of what they deserve !! On October 2011, at the age of 70 this gentleman was found dead at his home in Berkeley Heights, New Jersey, where he lived alone. He had been in frail health – even the cause and the exact time of his death were not clearly known and there was not much of media coverage, though Computer historians are under the impression that his influence was comparable. Many of us spend hours together on Computers staring at the screen pretending to do lot of serious work. Most of our work is done on Computers and shared with colleagues – still not many of computer’s basics are understood. You feel the hardware and somehow have commands executed through programmes. As one should know, the art of making computers respond to your commands or make it do the desired action is through languages – the programming language which primarily organizes the various parts such as Processor, the memory, the disk drives, the keyboard, the monitor, mouse and so on…..
Dennis MacAlistair Ritchie was an American computer scientist who "helped shape the digital era. He was the creator of the C programming language and, with long-time colleague, Ken Thompson, the UNIX operating system. 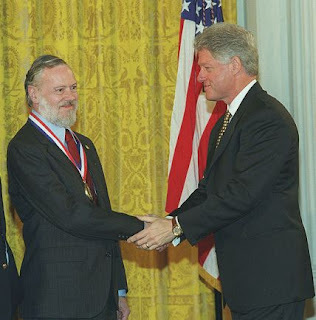 Ritchie and Thompson received the Turing Award from the ACM in 1983, the Hamming Medal from the IEEE in 1990 and the National Medal of Technology from President Clinton in 1999. Ritchie was the head of Lucent Technologies System Software Research Department when he retired in 2007. Ritchie lived in a very different time and worked in a very different environment than someone like Jobs. But he perhaps has not got the mark from the Computing World as deserving in the manner for the impact that he made on the way these equipments are used. C (pronounced like the letter C) is a general-purpose computer programming language developed between 1969 and 1973 by Dennis Ritchieat the Bell Telephone Laboratories for use with the Unix operating system. Although C was designed for implementing system software,it is also widely used for developing portable application software. C is one of the most widely used programming languages of all time and there are very few computer architectures for which a C compiler does not exist. C has greatly influenced many other popular programming languages, most notably C++, which began as an extension to C.
Dennis Ritchie and Ken Thompson were two bright Bell programmers had been assigned to work with MIT on the design of a complex multi-user operating systemn - Multics. Back in the lab, Ritchie and Thompson decided that they would just have to build the operating system themselves. So, in a fantastic burst of creativity they wrote Unics. Inevitably the 'cs' became 'x' and Unix was born. Thus did AT&T find itself the astonished proprietor of a uniquely powerful and innovative operating system. The problem was that it couldn't sell it, because under the Consent Decree that gave it the telephone monopoly AT&T was not allowed to be in the computer business. So the researchers in Bell Labs did what geeks do - they gave it away to their peers in university research labs. In doing this Ritchie and Thompson unwittingly launched the academic discipline of computer science, because universities were able to give their students free yet powerful software. Geeks were free to modify and improve on this -- which is what Bill Joy and his fellow students at Berkeley did when they created their own version of Unix, called BSD for Berkeley Software Distribution. It is stated that Apple is actually built on Berkeley distributed Unix and in some ways Apple really gave Unix a pretty face.